Available with us VFD Repair services at market leading prices. 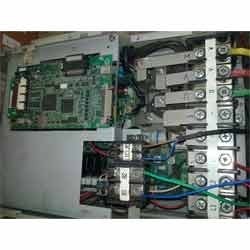 These services are offered by our trained professionals, who can repair variable frequency drives (VFDs) at component level. With the help of advanced technology, we provide troubleshooting and repair services at client’s factory. All OEM, non-warranty, upgrades and obsolete repair services are provided by us. Our expertise allows us to provide services for various reputed brands such as Omron, Yaskawa, Lenze, Siemens, Mitsubishi, Allen Bradly, ABB, Panasonic, RELIANCE and Fuji. Besides, we can perfectly service brands like FG, Moog , Hitachi, Toshiba, Schneider, Parker, Telemecanique,Donfoss, Delta, Hitech, Teco, Eurothrem,GENERAL ELECTRIC ,GE,KEB,B&R,Saf, Saftronics,ACOPOS, Bosch, Magnatek, SEW, L&T, Lust and Nord.